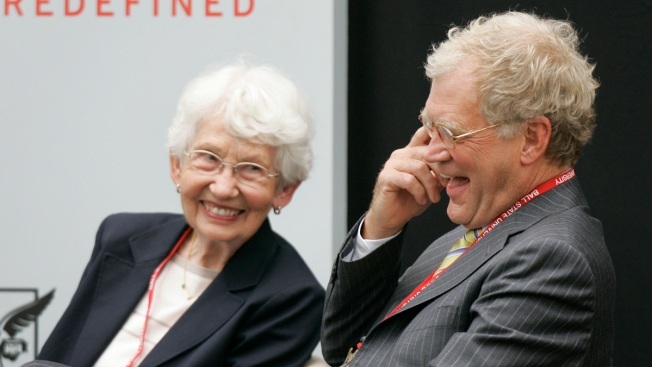 David Letterman, right, the host of "The Late Show with David Letterman" on CBS, and his mother Dorothy Mengering share a laugh during the dedication of the $21 million David Letterman Communication and Media Building on the campus in Muncie, Ind., Friday, Sept. 7, 2007. David Letterman has eulogized his mother, Dorothy Mengering, as a woman tough enough to kill a snake and whose television appearances became a popular fixture on his late night television show. The comedian told family and friends at a memorial service Saturday his mother once decapitated a snake with a hoe, to which he quipped, "My mother is Grizzly Adams, for God's sake." The Indianapolis Star reports dozens of mourners gathered for the service at Second Presbyterian Church on the city's north side. Mengering, who was 95, died at her Carmel home on Tuesday. She became an unlikely celebrity in her 70s, baking mystery pies and covering the Winter Olympics for her son's "Late Show" on CBS. Letterman says executives once told him, "People like her better than you."